You can use a Prandtl probe as flow velocity metering instrument mainly for open flow around solid bodies. However, it is also suitable for velocity measurement of air flow in a rectangle and round channels. With a Prandtl probe, you can measure flow velocity indirectly, by measuring a difference between stagnation pressure and static pressure of flow in a single point of a flow streamline. A Prandtl probe measures stagnation pressure in the central part of a Prandtl probe, where flow velocity equals zero. When flow velocity is zero at some point of streamline, measured pressure in that point equals total pressure. On the outer part of the Prandtl probe where flow streamlines are tangent to the Prandtl probe, the flow velocity is unimpaired, and the pressure measured at that part of streamline is called static pressure. The difference between stagnation and static pressure in one point of flow streamline is called dynamic pressure. Dynamic pressure represents kinetic energy, and flow velocity can be calculated using this calculator. 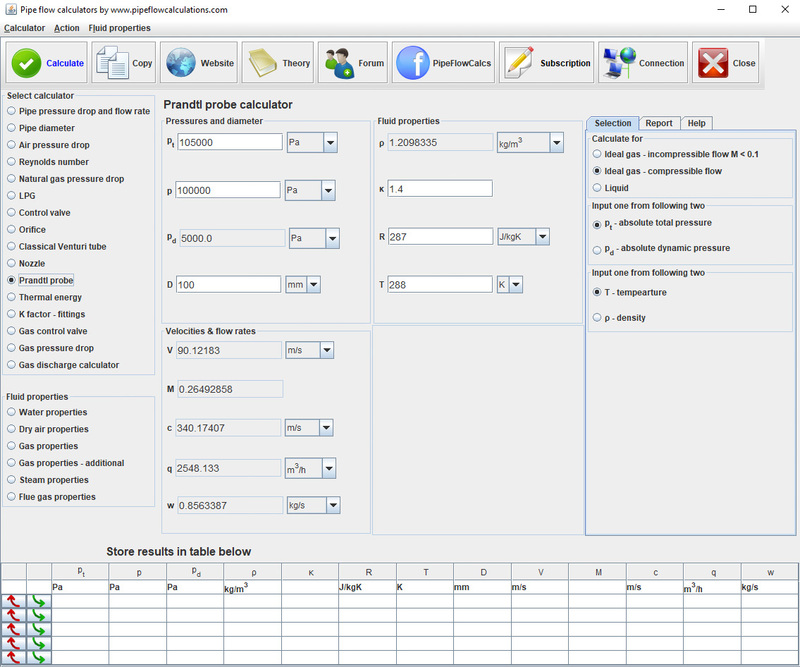 You can use the calculator for Pitot tube as well. A Pitot tube metering instrument is measuring stagnation pressure in one point of a streamline. After you measure static pressure by some other instrument like a barometer, you can compute dynamic pressure, and the flow velocity using this calculator. You can use this calculator for incompressible flow of liquids and compressible flow of ideal gases.